Carrying your dog or cat with you while traveling can be scary for both you and your pet. If you want safely transport your pets from place to placer while keeping them comfortable, expandable pet carrier is the right equipment to get. It is expandable to give your pet extra room to move and lay down, reducing stress on your pet while traveling. Must have for pet owners who love traveling. Want to take your pet on your long trip? 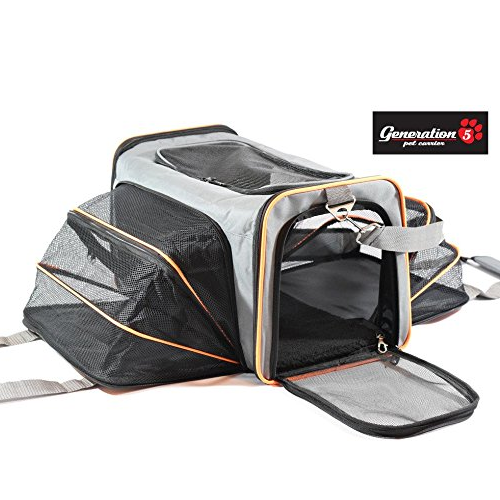 The Petsfit Expandable Foldable Washable Travel Carrier is a great way to keep your pet comfortable. 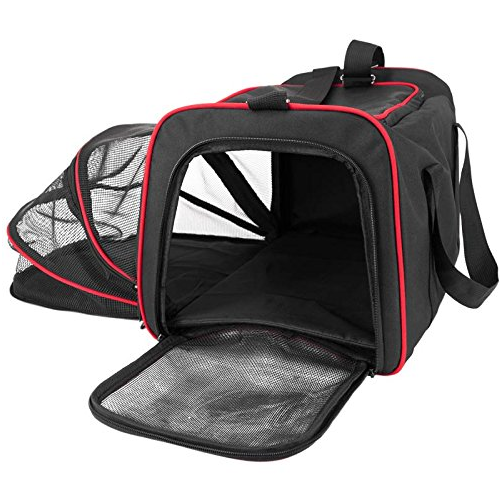 For pet up to 20 pounds, this pet travel carrier has several mesh designs for good ventilation. 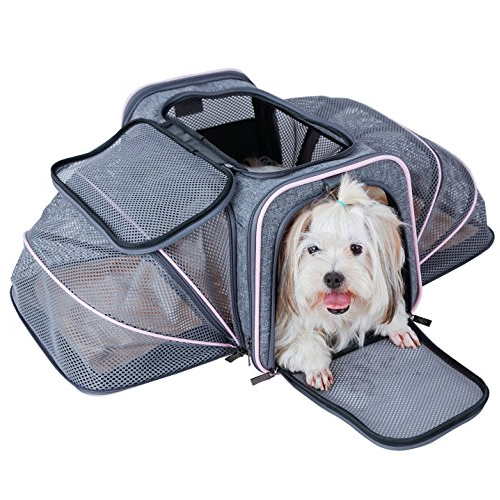 The expandable area allows your pet to have more space to move and increase air circulation. Wire frame in both sides support the carrier to be more stereo. Two zipper doors for easy access. Side-pockets provide added storage. 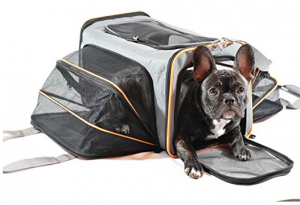 Make travel with your furry friend easier with the Frontpet Expandable Pet Carrier. 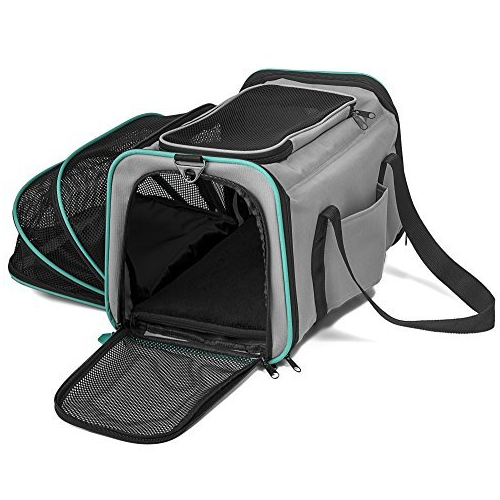 This expandable pet carrier save spaces when you need it and provides extra room for your pet’s comfort. The foam padded insert provides additional structure and comfort. Top, Side and Front mesh windows allow for ultimate ventilation and viewing. Also includes removable shoulder strap for added convenience. For pets up to 13 pounds. Made from durable and breathable materials, the Pet Cuisine Soft-sided Pet Carrier is the perfect travel solution for small breeds. The carrier features mesh panels that allow maximum airflow. The removable fleece bed gives your pet more space and convenience. 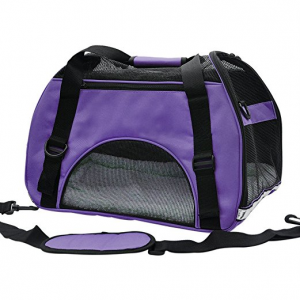 Lightweight and foldable, this pet carrier with adjustable padded shoulder strap is easy to carry. Suitable for pets up to 10 lbs. Great for puppies cats rabbits and other small animals. Travel in style with the Pawdle Expandable and Foldable Pet Carrier. This pet carrier expands to nearly double the interior space with the pull of a zipper to provide your pets with supreme comfort. The durable mesh panels allow your pet to enjoy the superior breathability. Wide, adjustable shoulder strap and handle make it easy to carry. Foldable design zips up flat into compact size for easy storage. Great for smaller pets up to 14 pounds. Your search for a sturdy and reliable pet carrier is finally over. The Generation Expandable, Airline Approved Pet Travel Carrier with durable construction is perfect for any pet owner who loves traveling. The carrier can be expanded by 9” on each side to provide ample space and optimum air circulation. It comes with a side strap that can easily slide onto your suitcase’s handle. Steel construction prevents it from collapsing. Both you and your pet will love it.